This bird looks like parakeet bird. I do not know name. Hello Ewka, thank you for sending us your pictures. 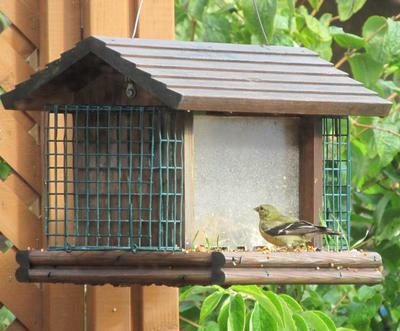 This bird is an American Goldfinch and they are lovely birds which are found all across Southern Ontario. The males are such a beautiful golden colour during the summer months, but become a dull olive colour in the fall, so you may not notice them as much, but they are still around. 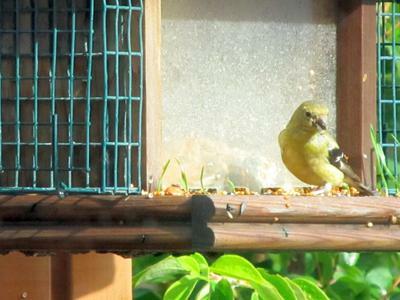 Goldfinches love nyger, thistle, and sunflower seeds and a lot will stay year round in the winter if you feed them. Sometimes I will have 30-40 in the winter time at my feeders.